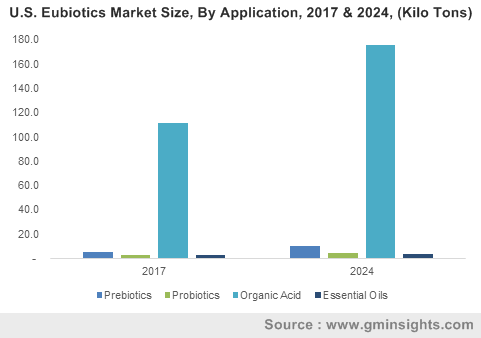 Eubiotics Market size was over USD 2.3 billion in 2017 and industry expects consumption above 1.5 million tons by 2024. Rising livestock diseases risk owing to rapid increase in consumption of meat products majorly in China, India and Brazil may enhance the market growth. Stringent government regulatory guidelines regarding antibiotics growth promoter (AGP) ban by EU commission and FDA has led to increasing usage for natural growth promoters. These products promote overall health and nutrition by enhancing feed utilization, immunity, efficiency and gut health thereby boosting the market growth. Increasing preferences towards high protein intake pertaining to health consciousness among consumers has led to increasing consumption of meat based products. Rising meat consumption in China owing to rapid urbanization and consumer demand for convenience meat based products is creating a positive influence on the market growth. More than 25% of the meat produced globally is consumed in China with approximately 50 kg consumed by an average citizen per year. Pork, beef and poultry are highly preferred in the country with approximately 74 million tons of production in 2017. Eubiotics suppresses harmful microbes and stimulates beneficial microorganisms thereby developing resistance to pathogenic infections and further promoting industry growth. Maintaining livestock health has become a necessity for farmers majorly for effective meat production. Increasing prevalence of diseases such as swine flu, bird influenza, foot & mouth diseases has led to lower productivity, fertility and higher mortality rates. More than 80,000 deaths occurred in 2017 due to influenza. Increasing risks of deaths has propagated livestock farmers to improve animal health and wellness regrading pathogenic infections, further boost market growth. Organic acids based may surpass USD 2.5 billion by the end of forecast period. Rising investments in research for examining role of organic acids to replace antibiotic growth promoters may enhance market growth. Additionally, these products are used as preservatives for animal feed thereby enhancing product quality and shelf life. Organic acids such as propionic, lactic formic and fumaric acids are used in commercial compound feeds majorly for feed preservation. These products also help in reduction of pH in stomach thereby optimizing pepsin activity and enhancing digestibility of nitrogen, minerals and phosphorous. Prebiotics market size from inulin may register gains at over 9.5% by the end of 2024. These products are extracted from chicory root which are further incorporated into animal feeds containing oligo and polysaccharides. Animal feed ingredients consisting of inulin promotes digestive health, calcium absorption and stimulates healthy gut microflora which further ensures proper nutrient absorption and overall wellbeing in animals. Dry form eubiotics may surpass USD 3 billion by the end of projected timeframe. Dry products help in enhancing shelf life of feed items thereby minimizing storage costs for feed manufacturers and stimulating demand for these products in animal feed. Liquid form eubiotics may witness growth of about 7.5% over the forecast period. These are highly used in pig feeding where major diets includes cereal grains and oilseed meals. Also, aquaculture industries are highly dependent on liquid feed which maximizes growth performance and enhances production and promoting market growth. Gut health applications may witness gains at over 8.5% over the forecast period. Rising gut health and viral infections may result in low productivity and efficiency along with increased costs for veterinary treatments. Promoting good microflora helps in limiting the growth of harmful bacteria such as clostridia, E.coli and salmonella, reduces toxin levels in intestine, promotes average weight gain and enhances feed conversion. Eubiotics market from immunity applications was valued at over USD 580 million in 2017. These products help in balancing effective gut microflora which is essential for proper functioning of natural biological processes such as nutrient absorption, improving digestion and ultimately improving immunity and stimulating eubiotics industry growth. Eubiotic market size from poultry applications may exceed USD 1.6 billion by 2024. These are utilized in poultry feeds, enhances broilers productivity, improves digestion and immune systems. Rising demand for poultry meat & eggs is propagating poultry manufacturers for adopting efficient methods for enhancing performance, yield and improving gut health which is further expected to boost industry growth. Eubiotics market from cattle applications may witness growth at over 8% by the end of 2024. Increasing usage for natural growth promoters such as prebiotics and essential oil blends improves cattle diets and helps in boosting meat quality further enhancing market growth. North America market demand led by U.S, Mexico and Canada was valued at over USD 400 million in 2017. Stringent regulations towards reduction in the usage of AGP’s in the region may have a positive effect on the market. Additionally, the elimination of antibiotics in broiler production and effective usage of natural growth promoters has led to higher reductions in mortality, reduced environmental impact, and effective feed conversion. Rising investments in funding regarding animal healthcare and overall wellness may promote regional industry growth. Europe market demand may witness gains at over 6.5% by the end of 2024. Rising consumer demand for safe and healthy meat, egg and milk products may propagate the usage of these products. The country is also major producer of milk based products which requires healthy manufacturing processes. Also, rising incidences of disease outbreaks in swine, poultry, and cattle industries requires healthy production process which ultimately leads to higher usage of eubiotics in the production process. Further, stringent regulatory policies against the usage of antibiotics may enhance regional product demand. Asia Pacific led by Japan, India, South Korea, and China market demand may surpass USD 1.1 billion by 2024. Easy availability of raw materials, low investment costs, and cheap labor force has attracted manufacturers interests in shifting their production facilities in the region thereby promoting regional industry demand. 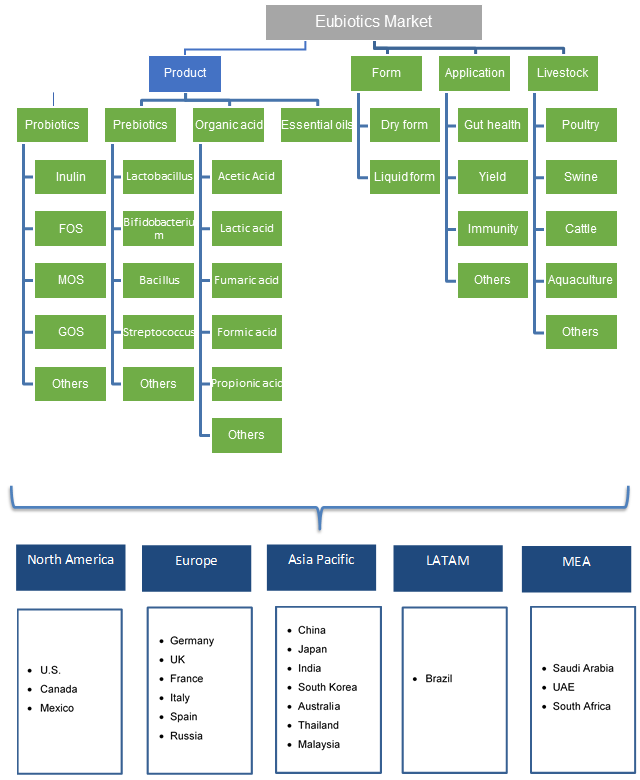 Global market share is competitive and consolidated with manufacturers such as BASF, DSM, Beneo, Cargill, Lallemand, Novozymes, Lesaffre and Kemin Industries. Manufacturers are highly investing in research & development activities to produce novel solutions for replacing AGP’s which may have a positive impact on the market. Eubiotics are natural growth promoters which are used as alternative products to AGP’s consisting of organic acids, prebiotics, probiotics and essential oils. These products improve feed digestibility, nutrient absorption, improves immunity and enhances better performance in livestock. These products are highly used in maintaining optimum balance of gut microflora leading to overall growth and maintenance in animals.